The editors of Control, Control Design and Smart Industry are on site at Rockwell Automation TechED 2016 to bring you the breaking news and best sessions from this world class event. Sujeet Chand, chief technology officer, Rockwell Automation, details how the company’s control and information architecture is designed to liberate longstanding silos of information, as well as incorporate and build upon new, disruptive technologies as they arise. → Read it here. Dean Kamen, the force behind the Segway, the insulin pump, the DARPA arm and Slingshot water purifier -- and lauded as one of America's greatest inventors -- explores the impact of his FIRST initiative. → Read it here. A real life look at how the Rockwell Automation architecture is used to boost machine and process productivity and quality. → Read it here. As more devices are connected, manufacturers are experiencing a deficit in skilled workers able to maintain plant floor equipment. Workers are simply not able to keep up with the growth of the IoT. With more devices coming on the network, the skills gap will continue to widen. → Read it here. Owensboro, Kentucky-based Mizkan Americas is happy to report that its Ragu sauce-production process is decidedly more modern, thanks to upgrading to FactoryTalk Batch software, implementing a virtualized server and standardizing kitchens on the new software. → Read it here. 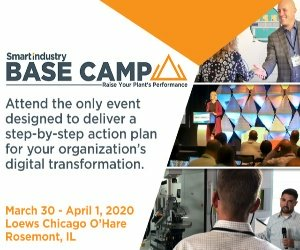 Khris Kammer, Information Partner and Competency Manager, Rockwell Automation, discusses the value of Fit-for-purpose software applications, which allow users to begin connecting their plant floor and enterprise systems for a fraction of the cost of an entire MES. → Read it here. When it comes to the Industrial Internet of Things (IIoT), “Smart assets are critical to the connected enterprise,” said Blake Moret, senior vice president of control projects & solutions and incoming president and CEO of Rockwell Automation. “These are the things in the IIoT, and we have home-field advantage.” → Read it here. “Smart, connected systems using intelligent devices are easier to operate and maintain, and will have higher uptimes,” said Brian Schriver of Rockwell Automation. “All the situations that would have required downtime, troubleshooting and other efforts can either be prevented or [resolved]." → Read it here. Over the past two years, smart manufacturing initiatives in areas around the world have led to public/private partnerships that are writing specifications for the Industrial Internet of Things (IIoT), the cloud and mobility, and industry consortia are forming to drive the initiatives. → Read it here. Rockwell Automation has made a number of technology investments over the past few years to boost the performance of its systems. The new high-performance architecture combines the Integrated Architecture with unified communications, systems intelligence and industrial information management. → Read it here. Rockwell's Scott Miller explores how expectations for HMI software are progressing as original equipment manufacturers (OEMs) and users seek to take advantage of new enabling technologies. More advanced software can help unlock new benefits by reducing design and commissioning time, as well as by boosting uptime and productivity. → Read it here. Along with reliable, real-time monitoring 24/7 from its control center, Duke Energy sought a new SCADA system that would give visibility to on-site operations and maintenance technicians, support control, allow emergency response, work at all the sites, and provide them all a consistent user experience, look and feel. → Read it here. Rockwell Automation previewed its new, forward-looking App Platform for mobility at this week’s TechED conference. While focused first on redefining smartphone use on the plant floor – with the aim of making individual workers more productive – this developing platform ultimately is intended to connect all pillars of the company’s Connected Enterprise vision. → Read it here. In an industry where computer systems often comprise poorly matched elements that don’t work smoothly, Chris Brogli, global business development manager for Rockwell Automation, discusses his company’s machinery Safety Life Cycle, which he says mitigates this issue by presenting a systematic approach to implementing and maintaining machine safety. → Read it here. Is the IIoT just the latest Y2K, or is there real business value? Analysis by LNS Research shows potential for great returns on investment, but it takes commitment. → Read it here. Andersen, North America’s largest maker of windows and doors, integrated an ERP system into its latest extrusion facility, which streamlines production reports, overall equipment effectiveness, quality, speed, schedule attainment, material used and material wasted. Manufacturers are seeing the measurable benefits that a virtual infrastructure can bring to their production environment. Rockwell Automation’s Chris Di Biase explains how up-front planning and bundled solutions can facilitate the transition to a virtualized production environment. The introduction doesn't have to be a "headache-inducing affair implemented by dedicated IT resources and expertise," he says. → Read it here. Post Consumer Brands, one of the largest producers of ready-to-eat cereal, struggled to maintain uncoordinated and obsolete HMI platforms. Key to the project's success was the use of modern, high-performance HMI architecture leveraging the power of virtualization, thin clients and FactoryTalk View SE. → Read it here.